Magnificent apartment with three bedrooms a few meters from the Real Alcázar de Sevilla. This is an exceptional apartment, furnished with all details and with furniture designed specifically for this apartment. Modern elements are combined with others more traditional and typical, but all of them with excellent quality. Upon entering the house, in front of us we find the kitchen, modern, functional and fully equipped, as well independent of the living room. Also, it is ventilated to a patio. To the right of the entrance there is the living room, completely exterior, with lots of natural light, facing San Gregorio Street. There is also a sofa bed (1.40 x 1.90 meters) that provides the apartment with capacity for up to eight people. A corridor connects the living room and the kitchen with the bedrooms and bathrooms. This apartment has two bedrooms, each with two single beds (0.90 x 2.00 meters each) and one with a double bed (1.50 x 2.00 meters). The bathrooms are of quality, they all have a shower and two of them are en suite with two of the bedrooms, while the third one is independent. The area of Plaza de la Contratación and Calle San Gregorio is simply spectacular. It is one of the most beautiful and historical areas of Seville. Here there are the Alcazar, the Archivo de Indias, the Cathedral of Seville, etc. It is a very quiet place as there are no bars or clubs, but it is very lively at the same time, as there are numerous typical sevillian bars and restaurants in which there are always local people from the city and many visitors. Santa Cruz is the most popular quarter in Seville and it has its origins in the old Jewish quarter of Seville. This quarter was inhabited by the Jews ever since Seville was recaptured by Ferdinand III, King of Castile, until these were ejected in the 15th century. 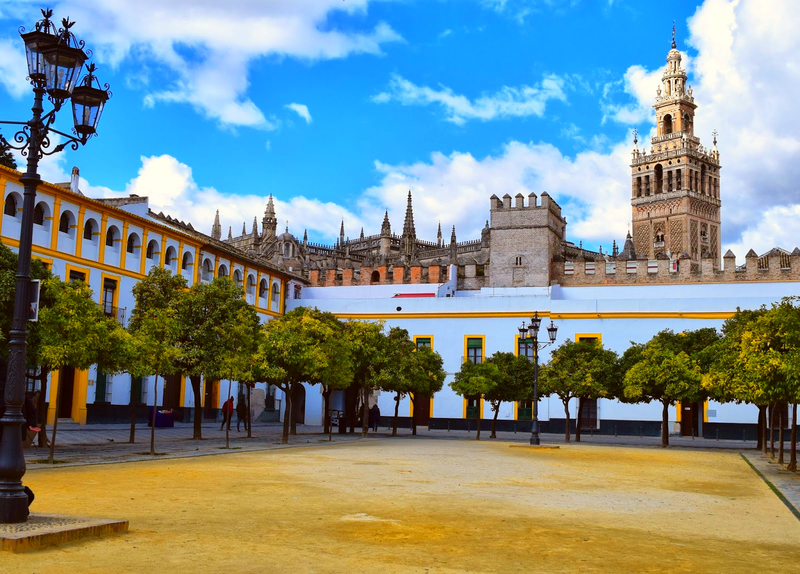 Located in the center of Seville, Santa Cruz quarter reaches down to the Cathedral, the gardens of the Alcázar (palace) and Jardines de Murillo (Murillo gardens). It is, therefore, a landmark and a touristic zone and it is accessible through Mateos Gago street, the most touristic and commercial street of the quarter. While having a walk in this zone, you can get to know more about its history, by contemplating the Moorish and Jewish features that so characterize this place. Furthermore, you can go into the narrow streets, which run in an irregular criss-cross pattern and lead to the patios sevillanos (traditional Sevillian patios) or squares, such as Plaza de la Alianza or Plaza de doña Elvira. During your stay in Santa Cruz quarter, you will feel like you belong here, Andalusia, since you will find yourself surrounded by Andalusian style houses and a pleasant and joyful atmosphere so typical of this region. Nearby places to visit are the Giralda tower, Patio de los Naranjos (orange tree courtyard), the Alcázar (palace), Archivo de Indias (archive of Indies) and the Palacio Arzobispal (archbishop’s palace). On the adjacent streets Iglesia de Santa María la Blanca (Santa María la Blanca church), los Jardines de Murillo (Murillo gardens) y el Hospital de los Venerables (baroque hospital) can be found.